Gastrointestinal cancers are heterogeneous and complex among the most common human cancers. In spite of this complexity, certain types of genetic alterations are linked to specific pathological lesions. Genomic and transcriptomic analyses have disclosed molecular subtypes that are characterized by specific genetic aberrations and expression signatures. Identification of better molecular markers to assist detection and prognostic evaluation of the cancer is therefore required. Tyrosine kinases are enzymes responsible for the activation of many proteins by signal transduction cascades. Inhibitors of tyrosine kinases (TKIs) have been effectively used for clinical treatment of certain types of cancer. Chronic exposure to gradually increasing concentrations of the TKI over a period of time, cells by activating modified signaling pathway can replace the lack of signal in target therapy, leading to the development of drug resistance. In recent years, researchers have specified different subsets of tyrosine kinase inhibitors’ potential resistance mechanisms in various gastric cancers. 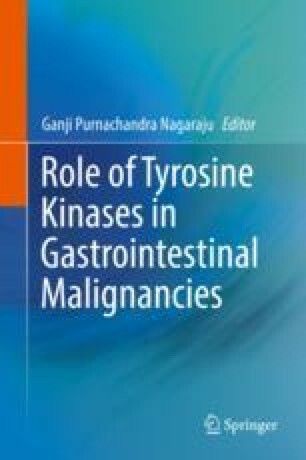 This chapter intends to provide an overview of the most recently identified molecular mechanisms of acquired resistance to tyrosine kinase-targeted therapy in various gastrointestinal malignancies.